Helmut Sigel, Astrid Sigel and Roland K.O. Sigel, in close cooperation with John Wiley & Sons launch a new Series “Metal Ions in Life Sciences”. 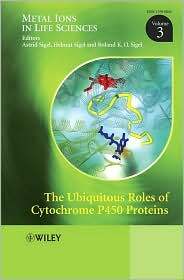 There exists a whole range of books on Cytochromes P450, but none with the focus of this volume. This new volume in the Series concentrates on current hot topics in the area and tries to work out the underlying common developments. As a result the reader will find a systematic account of new results in this exciting research area. The table of contents gives an idea on the wide span of chapters, starting with overviews and the presentation of specific systems, and ending with chapters on carbon-carbon bond cleavage by P450 sytems, drug metabolism as catalyzed by P450 systems, decomposition of xenobiotics by P450 enzymes and design and engineering of new P450 systems.